We're Still Here Silva Jennifer M.
The economy has been brutal to American workers for several decades. The chance to give one's children a better life than one's own-the promise at the heart of the American Dream-is withering away. In turn, "deaths of despair" such as drug overdoses, suicides, and cirrhosis of the liver are rising among the working class. The 2016 elections threw into sharp relief how little we know about how working-class people translate their grievances into politics. 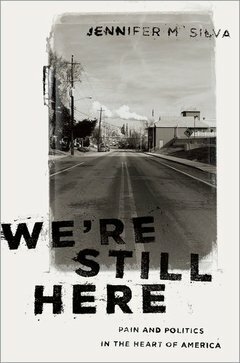 In We're Still Here, Jennifer M. Silva tells a deep, multi-generational story of pain and politics that will endure long after Trump and the elections of 2016. Drawing on over 100 interviews with black, white, and Latino working-class residents of a declining coal town in Pennsylvania, Silva proposes that the key to understanding the puzzle of working-class politics is to understand how the decline of the American Dream is lived and felt. In the post-industrial age, the routines and rhythms of traditional working-class life such as manual labor, unions, marriage, church, and social clubs have diminished. Moreover, the institutions that have historically mediated between individual, personal struggles and broader, collective political coalitions have become active sites of betrayal. In this void, individual strategies for coping with pain, and finding personal redemption, have themselves become sources of political stimulus and reaction among the working class. In the coal region, understanding how generations of Democratic voters come to reject the social safety net and often politics altogether requires moving beyond simple partisanship into a maze of addiction, joblessness, family disruption, violence, and trauma. How working-class men and women put the pieces back together - if they do at all-will have grave consequences for the future of American democracy. We're Still Here provides powerful, on the ground evidence of the remaking of working-class identity and politics that will spark new tensions but also open up the possibility for shifting alliances and new possibilities. Jennifer M. Silva is Assistant Professor of Sociology at Bucknell University. Her first book, Coming Up Short: Working-Class Adulthood in an Age of Uncertainty (Oxford, 2013) examines the transition to adulthood for working-class Millennials.